Athena 7 Minute Lift is a putty-like product that is supposed to reduce wrinkles, crow's feet and other noticeable aging lines on your face. The producers of Athena 7 Minute Lift claim that the product will work almost immediately and that nearly 84% of the lines and facial wrinkles will dissipate. You can purchase a 60 day supply of Athena 7 Minute Lift for $89. Using Athena 7 Minute Lift is a bit of a project. Dip a concealer brush into a little water, and then dab the brush into the product. Brush the product on to your problem areas but be sure not to use too much of the Athena 7 Minute Lift. You must also be certain to keep the brush moist. If you use too much product you may see some residue. While Athena 7 Minute Lift's anti wrinkle cream formula contains none of the new generation of anti aging ingredients such as Argireline, it may a good solution for people wishing to use essential oils only. If Athena 7 Minute Lift does work for you, the positive results will disappear in a 7-10 hours. Since the wrinkles and age lines will resurface, you will have to go through the application process every day if you want any results. That may be a problem for some people because it does take time to apply Athena 7 Minute Lift. How does Athena 7 Minute Lift compare? 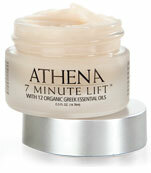 Athena 7 Minute Lift is manufactured by Greek Island Labs LLC.